This wonderful salad uses lots of fresh ingredients, and gets better the longer you refrigerate it. It’s a terrific dish to take to a potluck or any kind of get together. 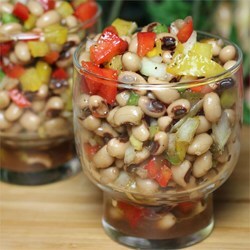 Mix the yellow and red peppers, onion, jalapeno chiles, black-eyed peas, parsley, and garlic together in a large bowl. Whisk the red wine vinegar and balsamic vinegar together in a small bowl. Gradually add the olive oil, whisking constantly to thoroughly blend with the vinegars. Stir in the cumin, salt, and black pepper. Pour the dressing over the vegetable mixture, tossing to coat evenly. Cover and refrigerate 3 to 4 hours. Just before serving, stir in the crumbled bacon.